For adults, take one (1) scoop (33g), one to two times daily. Serious athletes should consume 1-2 scoops twice per day for maximum muscle support, with at least 1-2 scoops taken immediately after exercise. If you are pregnant, nursing, taking any medications or have any medical condition, consult your doctor before use. Discontinue use and consult your doctor if any adverse reactions occur. Not intended for use by persons under the age of 18. KEEP OUT OF REACH OF CHILDREN. STORE AT ROOM TEMPERATURE AND AVOID EXCESSIVE HEAT. Protein blend (whey protein concentrate, whey protein isolate), cellulose gum, xanthan gum, natural and artificial flavors, soy lecithin, dicalcium phosphate, calcium carbonate, acesulfame potassium, sucralose. For adults, take one (1) scoop (30 g), one to two times daily. Serious athletes should consume 1-2 scoops twice per day for maximum muscle support, with at least 1-2 scoops taken immediately after exercise. Blender - Simple Add one scoop of MET-Rx 100% Ultramyosyn Whey to blender filled with 6-8 ounces of your favorite beverage. Cover and blend for 20-30 seconds. For a delicious smoothie, add peanut butter, fruit, or yogurt along with ice cubes. Shaker - Simpler Fill a shaker bottle with 6-8 ounces of your favorite beverage. Add one scoop of MET-Rx 100% Ultramyosyn Whey. Cover and shake for 25-30 seconds. Glass & Spoon - Simplest Add one scoop of MET-Rx 100% Ultramyosyn Whey to 6-8 ounces of your favorite beverage. Stir for 20-30 seconds or until completely blended. ^^For Mass Gaining: add higher calorie foods such as peanut butter, 1-2% milk, and fruit juices. ^^For Dieters: add lower calorie foods such as skim milk, blueberries and raspberries, or just use water. To support muscle-building, consume approximately 1 gram of protein per pound of body weight from all dietary sources per day. Notice: Use this product as a food supplement only. Do not use for weight reduction. Protein blend (whey protein concentrate, whey protein isolate), cocoa (processed with alkali), natural and artificial flavors, peanut flour, soy lecithin, cellulose gum, xanthan gum, dicalcium phosphate, calcium carbonate, acesulfame potassium, sucralose. Contains milk, soy, peanut and tree nut (pecan) ingredients. Protein Blend (Whey Protein Concentrate, Whey Protein Isolate), Cellulose Gum, Xanthan Gum, Natural And Artificial Flavors, Beet Powder (color), Soy Lecithin, Carageenan, Dicalcium Phosphate, Calcium Carbonate, Acesulfame Potassium, Malic Acid, Citric Acid, Sucralose. Ultramyosyn® Protein Blend (Ultrafiltered Whey Protein Concentrate [which contains Beta-lactoglobulin, Alpha-Lactalbumin, and Glycomacropeptides], Microfiltered Whey Protein Isolate), Natural and Artificial Flavors, Cellulose Gum, Soy Lecithin, Xanthan Gum, Dicalcium Phosphate, Calcium Carbonate, Acesulfame Potassium, Sucralose. Protein blend (whey protein concentrate, whey protein isolate), cocoa (processed with alkali), natural and artificial flavors, peanut flour, cellulose gum, soy lecithin, dicalcium phosphate, calcium carbonate, acesulfame potassium, sucralose, xanthan gum. 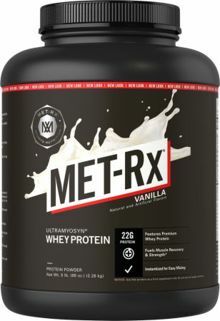 MET-Rx Ultramyosyn Whey provides gold standard, cross-flow Whey Protein sources including Microfiltered Whey Protein Isolate and Ultrafiltered Whey Protein Concentrate. Precise laboratory techniques are utilized to retain the active Whey Protein Peptides and Microfractions including: Beta-lactoglobulin, Alpha-lactalbumin, Glycomacropeptides, Lactoferrin, and other bio-active components. Contains naturally occurring Branched Chain Amino Acids. Each serving contains over 4g of the following Branched Chain Amino Acids from protein which typically provides: 1.28g of Isoleucine, 2.23g of Leucine, and 1.21g of Valine.